Remote shower mixer unit with diverter and digital display touch control panel (with LED back lights). Built in diverter to switch between two shower outlets. Waterproof controls with digital temperature display for use inside or outside shower enclosures. Touch control lighting changes colour with water temperature, from blue (cold) to purple and then red (hot). 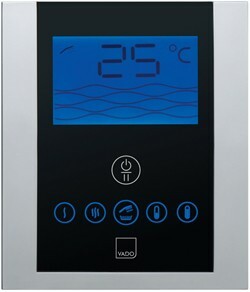 Touch controls: 7 temperature settings, 3 flow rate settings and on/off control. Automatic shut down: If no controls are touched for 15 minutes this shower will automatically switch off. 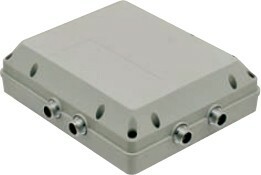 Control unit can be mounted horizontally or vertically in a suitably dry place. All electrical connections must be carried out by a qualified electrician. Control unit requires a 3 to 5 amp RCD electrical connection and earth (connected outside of the bathroom). Electrical connections: 220 - 240V (AC/50Hz). Maximum power rating: 16 Watt. Water pressure required: 2 to 5 bar. 12 Year Guarantee: Vado guarantee their Identity range for 12 years. The amazing Vado Identity range of taps and shower valves feature futuristic touch controls, concealed mixers, and LED lighting to add a whole new dimension to your bathroom. Since 1993, Vado International have been globally recognised for their high quality bathroom products.